High Intensity drum magnets are very suitable for separating stainless steel. These drum magnets are equipped with extreme powerful magnets which makes them a perfect solution for separating very small iron particles as well as stainless steel. The magnetic part of the drum is suitable for optimal adjustment to your situation. For the most optimal separation and easy installation we build these drums on a frame combined with a vibrating feeder. These systems can be fitted with a Ø300mm or Ø400mm High Intensity drum and include an SEW engine, vibrating feeder and the framework on which everything is mounted. This makes it easy to install or it can be used as a stand-alone system. 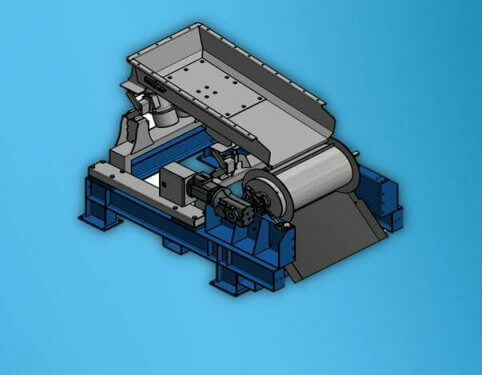 If you’re processing abrasive materials we can equip the drum with a manganese shell and the feeder with a manganese plate to reduce impact and prevent them from excessive wear.